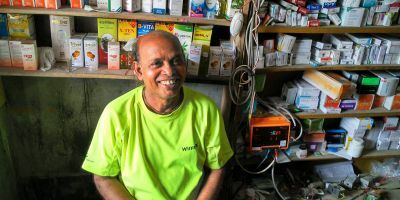 At Davos: How can research drive collaboration in a fractured world? 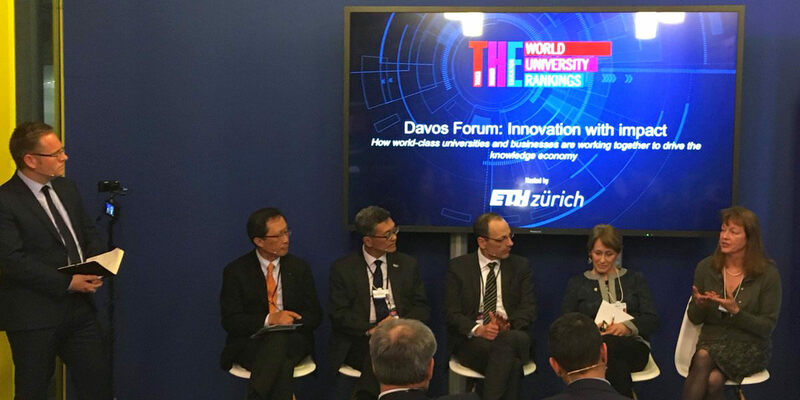 Elsevier chairman Youngsuk "YS" Chi (seated, far left) with members of the the Global University Leaders Forum (GULF): Dr. Tan Eng Chye, President of the Natonal University of Singapore; Dr. Lino Guzzella, President of ETH Zurich; Dr. Suzanne Fortier, Prinicipal and Vice-Chancellor of McGill University; and Dr. Alice Gast, President of Imperial College London. 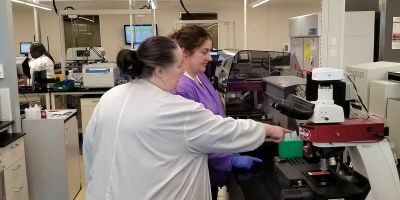 Partnering with international institutions and industry has a positive impact on research quality, confirms a new Elsevier report that maps the industry and academic collaborations of some of the world’s leading universities. Delegates examined the study and its implications at the annual World Economic Forum (WEF) meeting in Davos, Switzerland, last week as part of the Global University Leaders Forum (GULF) gathering. The event featured the release of a new Elsevier-Times Higher Education research study, developed exclusively for presentation at Davos. The report, titled Research that pays: knowledge transfer at the world’s top universities, analyzed the contribution the world’s leading universities make to the global knowledge economy through research collaboration with industry. 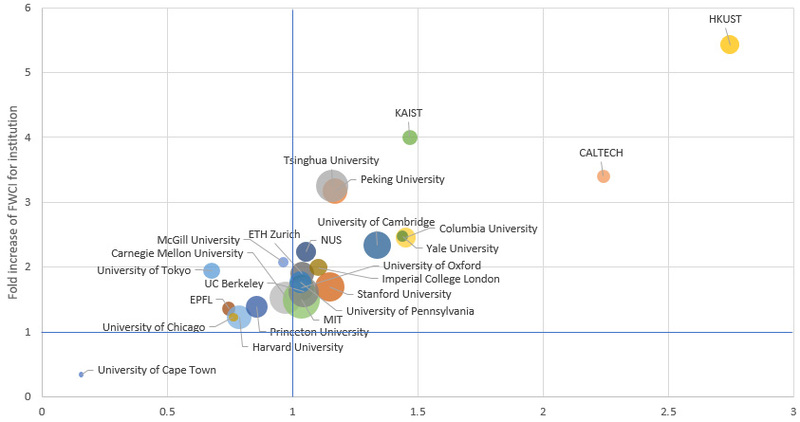 Drawing on Elsevier’s Scopus data, the study mapped the research collaborations and their impact between Industry and the 27 member universities of WEF’s GULF, 10 of which top the Times Higher Educations’ global university rankings. The theme of the WEF gathering – “Creating a Shared Future in a Fractured World” – resonated with the report’s findings, which prove that for universities at least, collaboration is a key contributor to performance success. Read more about this discussion on the Times Higher Education website. Phil Baty, Editorial Director of THE’s global university rankings, interviews university presidents on the economic impact of industry-academia collaboration and innovation. The GULF group’s world publication share was 7 percent over the period 2012-16. 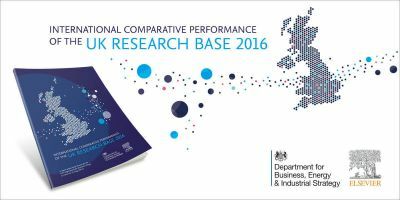 This is higher than the share of several leading research nations, including the UK (6.4 percent), Germany (6.1 percent) and Japan (5 percent). The study made it clear that working with institutions in other countries has a positive impact on the quality of the research produced, as measured by the field-weighted citation impact (FWCI). Learn more about field-weighted citation impact (FWCI) and other metrics. The GULF group’s European universities were the most focused on collaboration – particularly the Swiss. Asian universities, except for the National University of Singapore, worked least with institutions in other countries, while the GULF group’s US universities fell somewhere in the middle (tending to favor inter-state collaborations instead). Perhaps unsurprisingly, the strongest collaboration ties were among the GULF universities producing the largest volumes of research. Other findings include how Asian universities automatically got plotted in proximity of each other due the close collaboration. The map also shows some strong collaborations impact wise between universities that don’t necessary produce the most impactful publications overall. Over the period 2012-2016, the percentage of publications resulting from collaborations between GULF group institutions and the corporate world was stable – ranging from just under 5.1 percent in 2014 to slightly above 5.3 percent in 2012. Similarly, the FWCI was also stable, hovering around 3. 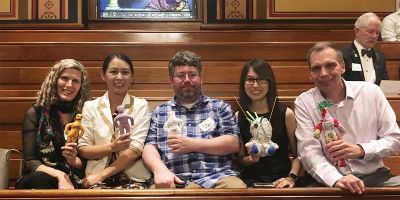 The US’s Carnegie Mellon University and Massachusetts Institute of Technology (MIT), along with the Korea Advanced Institute of Science and Technology (KAIST), showed the highest rate of collaboration with industry (9.6 percent, 8 percent and 8.2 percent respectively). However, all three saw a decline in the growth rate of their corporate collaborations over that period: -4.1 percent, -1.9 percent and -0.1 percent respectively. 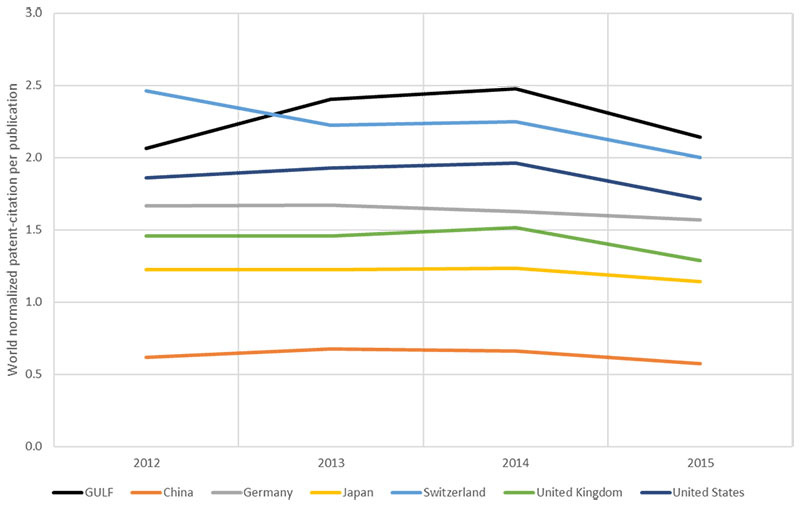 The UK’s University of Oxford showed a strong growth rate in the FWCI of papers co-authored with industry, as well as those co-authored with international institutions. When looking at the industry partners, the GULF group collaborated most with Microsoft, IBM, GSK, Pfizer and Google. The collaborations with GSK and Microsoft were the most impactful, leading to FWCIs of 4.8 and 4.2 respectively. The US’ MIT and Carnegie Mellon, and China’s Tsinghua University, were the most frequent collaborators with Microsoft in the period 2012-2016. Together, they co-published 294, 226 and 227 papers respectively. 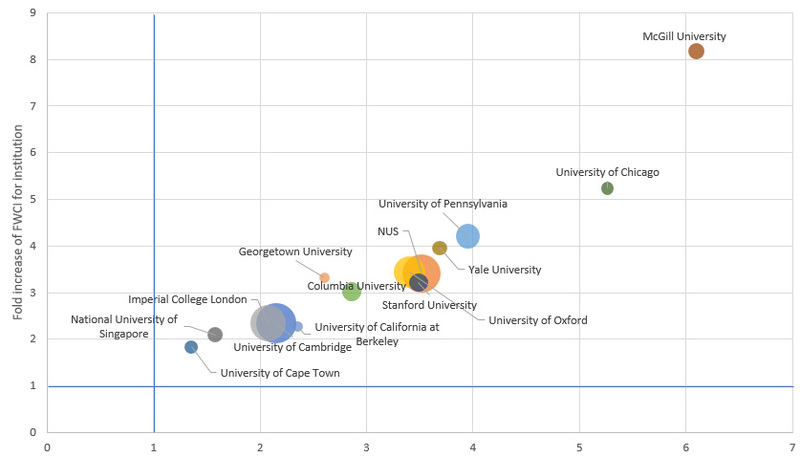 All universities, except South Africa’s University of Cape Town, benefitted from collaborating with Microsoft in terms of publication impact (FWCI). The FWCI for Hong Kong University of Science and Technology (HKUST) benefitted more than 5 times. In fact, the highest collaboration impact (as measured by the FWCI) was with HKUST at 10.71. Microsoft, on the other hand, doesn’t seem to have benefitted (in terms of FWCI) from all collaborations. 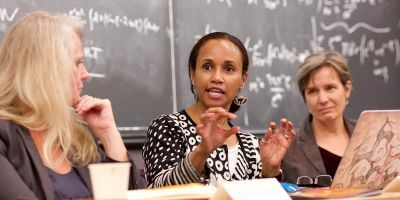 This is the case with University of Cape Town, University of Tokyo, École polytechnique fédérale de Lausanne, McGill University, Carnegie Mellon, Harvard University, Princeton University and the University of Chicago. This is likely explained by these institutions’ focus on nature research. The UK’s University of Cambridge and Imperial College London, and the US’s Harvard University, collaborated the most with GSK. In the period 2012-2016, they co-published 268, 224 and 257 papers respectively. The highest collaboration impact (as measured by the FWCI) was with Canada’s McGill University at 14.8 (although this takes into account 44 papers only). All universities benefitted from collaborating with GSK and vice versa in terms of publication impact (FWCI). As a group, the GULF universities had a larger patent-citation share than many research-intensive countries such as the UK, China, Germany and Japan. 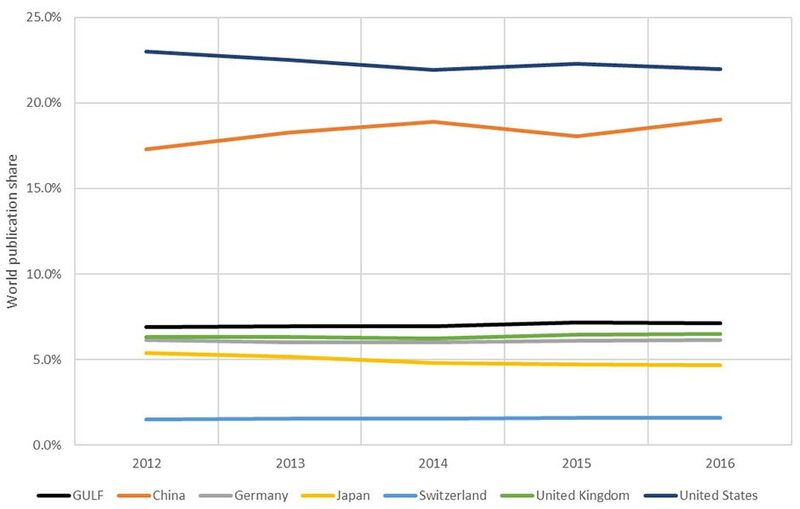 And, relative to the number of publications produced, the number of publications cited by patents proved to be higher than for some of those nations. If we consider all papers published by the GULF group between 2012-2016, those publications downloaded by the corporate world ranged between 14.75 percent in 2012 and 16.03 percent in 2015. This percentage was higher than world numbers, which ranged between 12.93 percent and 14.14 percent over the same period. In both cases, a slight decline was visible in 2016, but this is not surprising given that the typical lead time for discoverability is more than a year. 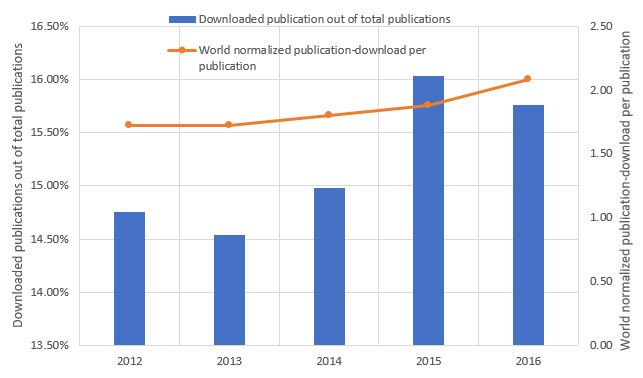 The world normalized publication-download per publication grew steadily from 1.72 in 2012, to 2.09 in 2016; a growth rate (CAGR 2012-2016) of 4.9 percent. What is the Global University Leaders Forum (GULF)? The GULF’s 27 members are presidents of some of the world’s top universities. They work together to address relevant educational, scientific and research agendas. They also act as an advisory body providing intellectual stewardship to the World Economic Forum. Patent citations: How much of the GULF group’s research is being commercialized? Research publication downloads: How much is its research being read? Research output: What is the volume and are there any trends? Relative article share: Relative to the GULF group’s size, how does it compare to some of the leading research nations? 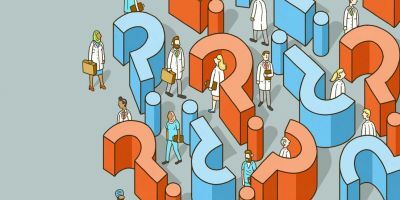 Research impact: Is the GULF group’s research being cited frequently and influencing other cutting-edge work? 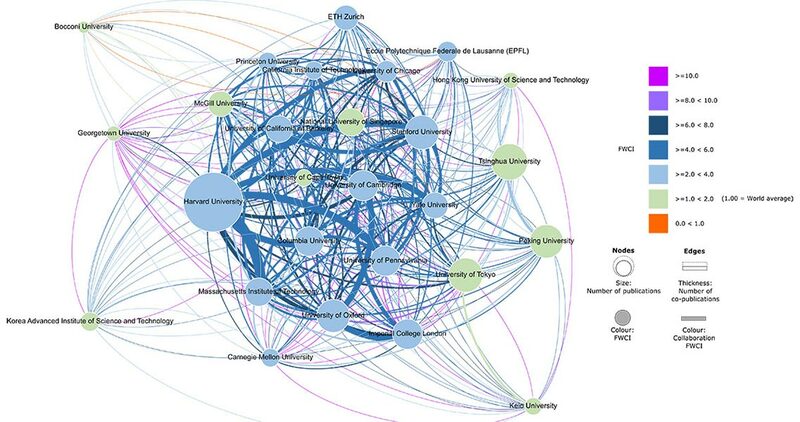 Research collaboration: How connected is the group and its member universities to each other, institutions internationally, and industry? Patent citations comprise publication references in LexisNexis’s Univentio, a full-text patent database with coverage of more than 65 million patent publications from over 80 countries. Usage (downloads) statistics are based on publication full-text downloads in ScienceDirect, Elsevier’s full-text database of peer-reviewed literature, which has articles from more than 3,800 journals across a wide range of research fields and accounts for approximately 16 percent of the articles indexed in Scopus in 2016. 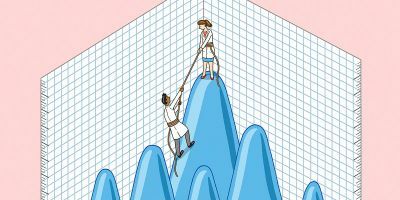 * Our thanks to the Times Higher Education for their design work on the charts and graphs featured in this article. M'hamed el Aisati is VP of Product Management, Funding and Content Analytics at Elsevier. He holds an MSc in Computer Sciences from the University of Amsterdam. After joining Elsevier in 1998, M'hamed contributed to the realization of the first Elsevier digital journals platform preceding ScienceDirect, and later on in 2004, stood at the cradle of Scopus, which he helped launch. In 2010 he took on the role of Director of Content & Analytics. He heads a technology and analytics team in assembling relevant data, supporting large research performance evaluation programs, and applying custom analytical tools in large-scale projects that aim to provide insights to governments, research institutions, and funding agencies. Recently, his responsibilities expanded to include Research Funding solutions. M’hamed holds two patents and specializes in product development, big data, analytics, and service-oriented architecture.